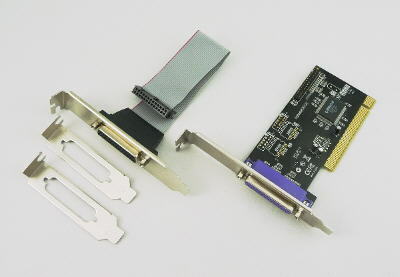 This adapter card goes into a PCI slot in the host computer and provides one or two DB-25 parallel ports. It is designed for a 5 volt 32 bit PCI slot (the most common type) and will output 5 volt signals to the parallel port pins. The first female DB-25 is on the plug in card bracket. The second is on a cable with an extra metal slot bracket. Alternate brackets are provided for short height enclosures that require low profile cards. 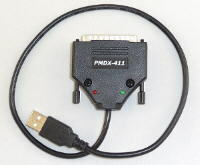 This card is tested and known to work with bi-directional modes so that pins 2-9 of the second parallel port can be used as inputs with Mach software. The Geckodrive G540 charge pump signal will work with this card without having to set EPP mode. The G540 normally requires the port to be in EPP mode and most PCI bus cards (unlike motherboard parallel ports) cannot be forced into EPP mode. PMDX has custom modified the first port of this card to be compatible with the G540. It is also compatible with all PMDX products and with most conventional breakout boards. OS system drivers are provided for Windows 2K, WinXP, Vista, Windows 7, and most Linux systems. Drivers for DOS are not available for this card. The OS drivers for PCI bus cards will set up PCI port addresses based on your system. You will need to use Windows or Linux to tell you what address was used. Keep in mind that the parallel port driver that is part of Mach software will only run on 32 bit versions of Windows. Normally the first port will install with the higher numbered port address and the second port will install with the lower numbered port address. 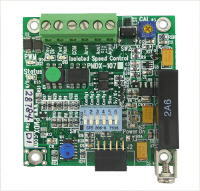 This board is not recommended for use with EMC2 software under Linux when driving products from MESA Electronics, PICO Systems, or others that require EPP handshaking modes. Note: Cables are sold separately. Please be sure to also order the cables that you need.